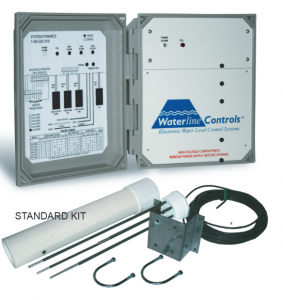 If you are searching for cooling tower water level controls, Waterline Controls can help! We manufacture state-of-the-art water level control systems capable of automatic water level control in cooling towers, remote sumps, evaporative condensers and closed circuit fluid coolers. Our stainless steel cooling tower level sensors or probes accurately measure water levels in any size cooling tower basin or sump. Our electronic water level controllers are direct replacements for BAC, EVAPCO and Marley Cooling towers. Most popular queries used to find our cooling tower water level controls include: Cooling tower water level control, cooling tower level control, cooling tower level sensor, cooling tower water level sensor, evapco electronic water level controls, cooling tower fill valve, cooling tower basin level sensor, tower controls, cooling tower float switch, cooling tower alarm, cooling tower low water alarm, cooling tower level switch, cooling tower high level alarm and control system for level control of water cooler. They may look like the competition but the unit is revolutionary in its design. The WLC Series is perfect in any application where water level management is important such as cooling tower basins, cooling tower sumps, evaporative condensers and water holding tanks for cooling towers. Our revolutionary water level control system uses a microprocessor that monitors all sensor probes for correct operation and then provides the corresponding outputs to drive the power relays, the Building Automation System and a visual indication of the operational status (led lights). The Modular construction and a self-test feature insure user-friendly operation. By using a very low voltage and current, WLC Series sensors never foul, plate or degrade like float switches do. So when we say “Never Replace A Water Level Controller Again” we mean it! These Kits are considered a complete kit for water level control and management. They include the water level control sensor, the mounting assembly for the sensor and the WaterLine Control panel. The only other item needed is a fill valve which connects directly to these units. We have designed and created an advanced state of the art Cooling Tower Sensor and Control System for water level control. Our Stainless Steel Sensors accurately measure water level regardless of water quality, without failing or corroding. We offer a direct replacement cooling tower water level controls that have a 15 year expected duty life with very little to no maintenance required. Our Cooling Tower Sensor uses stainless steel probes with up to six functions to maintain the water level, alert the facility manager of high or low levels, cut off a basin heater, and read the water temperature. All of these functions are controlled by software, which can be directly connected to the Building Management System using dry contacts. Ensure your evaporative cooling application lives a long and hard working life by choosing Waterline Controls. Commercial markets use evaporative coolers for water in the form of cooling towers. In both water and air cooling applications, evaporative cooling relies on constant water flow. It is common for a small mechanical float to be installed on the basin to control the fluctuation of the water level, but these floats are regularly unreliable and unable to inform the building management system of how much water there is in the basin. Never Replace Float Switches Again! We offer a 100% Satisfaction Guarantee along with our 5 Year Limited Warranty so you can be sure you are getting the best product for the best value you can expect. Water level management is one of the most critical aspects of a properly operating cooling tower system. With dry-contact integration outputs in every Waterline Controls model, this critical function can be easily tracked and controlled using your existing building automation system. Waterline Controls’ over 20 years of experience takes the guesswork out of water level management. Any Waterline Controls’ electronic controls unit can be used to replace worn out BAC*, Evapco* and Marley* cooling tower units. But, if you need a direct replacement, you can order them from us and SAVE MONEY. 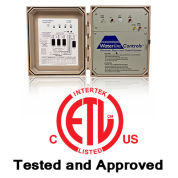 With our system, you will never have to replace a water level controller again! Our direct replacement models include all the features and functions of the other brand name units including Vanstone flange-style assemblies and custom sensor lengths from one inch to ten feet. PLUS our direct replacement models ALSO INCLUDE the following exclusive features & benefits available ONLY in Waterline Controls’ electronic level controllers. Low & High Level Alarms – Low and high alarms are used to warn you about low or high water levels. The alerts are sent from the sensor rods to the dry contacts that light up LED alarm indicators to tell you when water levels are too high or too low. Makeup Water Control – Our water level sensors can regulate water levels in cooling tower basins to ensure normal operating levels. When the water levels gets low, the sensor sends a signal to the control panel to turn on the fill valve and fill the water back up to its normal operating level. Low Water Cutoff – The low water cutoff switch is used to stop pumping water when lower than normal water levels are detected. This feature prevents expensive water pump repairs. Dry contacts can also be used with pilot duty controls or digital control systems to force shutdown of pumping equipment during low or no water situations. Electrical: Controls operate at 0.5AMPS at 110VAC Internal Relay Contacts rated 30AMPS at 250Volts Dry Contacts for BAS are rated 0.5AMPS at 60Volts. *Disclaimer: The trade names in this page are owned by their respective companies or are the same name as the company. They are mentioned for comparison purposes only. They are in no way affiliated with System Dynamics, Inc or WaterLine Controls. The Blank spaces below mean “No Connection or Function” and *All controls have built-in self testing systems. You are always my first choice for electronic make-up systems!! Went well. Customer seems happy with the installation on his cooling towers. Thanks Again. The installation went very well. The controllers have been working without any issues and communicating with the BMS. I hold your company in the highest regard as far as customer service goes. You folks are top notch. Thanks again!